It’s a common occurrence. After the rush of a holiday season, post-season employment declines and unemployment rates rise. That’s exactly what has happened across Ohio this year, and also the case for Mansfield and Richland County. 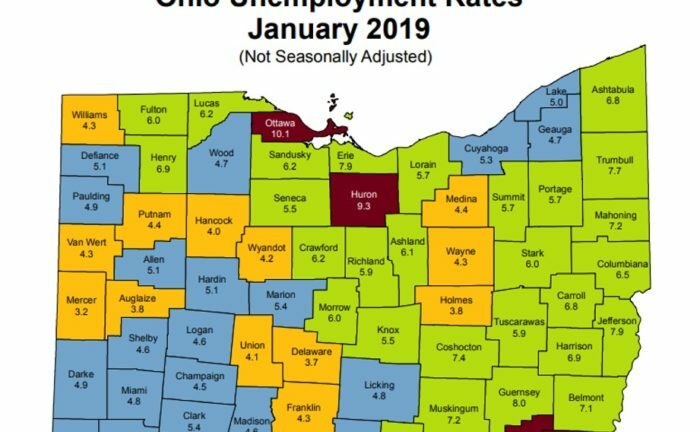 The Ohio Department of Job and Family Services released the January 2019 employment numbers this week, and reported that Ohio’s unemployment rate was 4.7 percent in January, up from a revised 4.6 percent in December. Ohio’s nonagricultural wage and salary employment increased 20,300 over the month, from a revised 5,583,300 in December to 5,603,600 in January 2019. The number of workers unemployed in Ohio in January was 269,000, up 2,000 from 267,000 in December. The number of unemployed has increased by 11,000 in the past 12 months from 258,000. The January unemployment rate for Ohio increased from 4.5 percent in January 2018. The U.S. unemployment rate for January was 4.0 percent, an increase from 3.9 percent in December, and a decrease from 4.1 percent in January 2018.